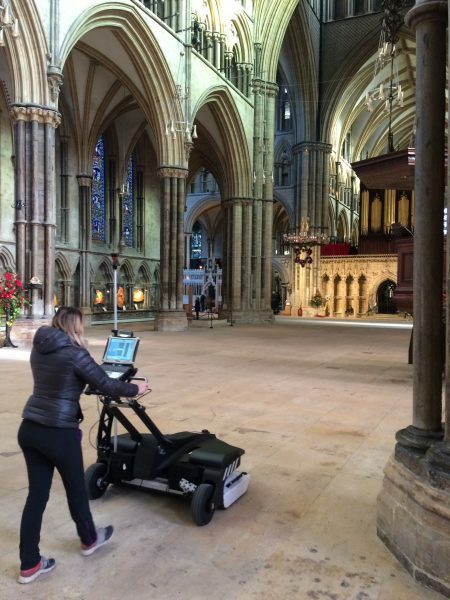 A Ground Penetrating Radar (GPR) survey, carried out at Lincoln Cathedral, revealed a series of ancient structures and a World War II water tank beneath an area of the site designated for development. The detailed subsurface survey data provided by Technics in August 2016 was used to support plans for a new shop, museum and restaurant on the historic site. Planners commissioned the survey to minimise the risk of damage to any buried archaeological evidence, and to plot the position of the existing utilities. Surveyors employed a suite of sophisticated GPR systems to capture multiple 3D data sets in high resolution for post-processing the detectable utilities and archaeological features. Constructed in 1072, the Cathedral is steeped in history, with records of late Saxon and two 12th – 17th century courtyard houses sitting within the survey area. It was therefore paramount that the surveys were undertaken to allow development at the site to begin. GPR identified a water storage tank installed during the Second World War as a contingency measure, in the event the Cathedral was set alight during a bombing raid and its water supply disrupted. 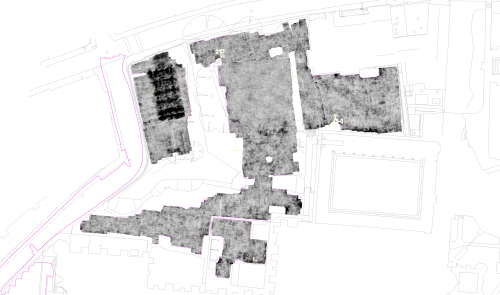 Further analysis of the GPR data revealed a mass of previously unknown, deeply buried structures, thought to be Roman walls, as well as parts of post-Roman and Medieval buildings. Existing evidence from boreholes included traces of Roman tiles, ceramics, plaster and tesserae. The GPR survey confirmed the position of Medieval traces to experts at Lincoln Cathedral but the Roman structures beneath them was new and vital information, and prior knowledge of them allowed the Cathedral to successfully modify the designs for this area. Damage was minimised, and projects costs controlled, as appropriate recording programmes for archaeological features affected by development could be put in place before work began.